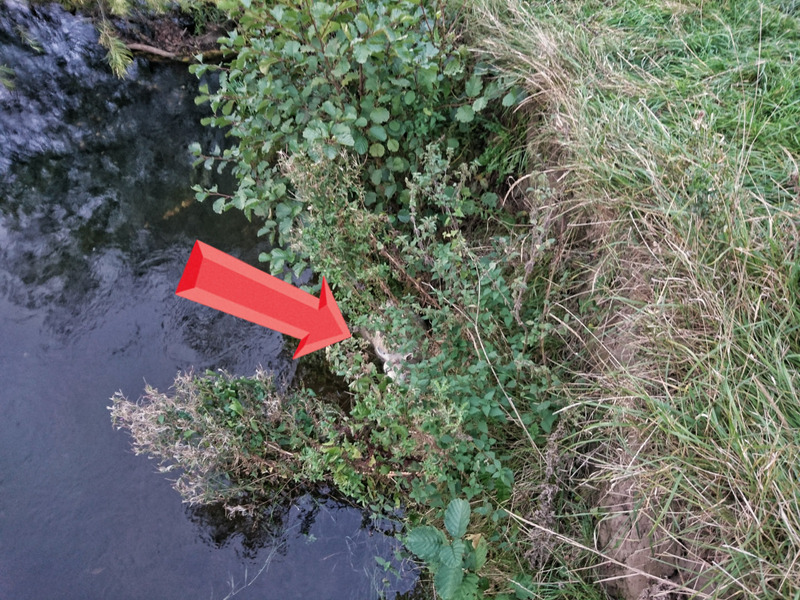 Andrew Kennedy's Angling Blog at Just-Fish.co.uk - Fishing Blog Coarse Fly Lure Pike Perch: A woolly jumper in a bit of a predicament! I've had a few strange happenings during fishing sessions this year. Such as a mystery animal sprinting towards me in the dark, straight into my legs before disappearing! By the sound of it's light, rhythmic scampering as it approached I'm pretty sure it was a stoat (definitely that kind of size) but I'll never know! Then, just last week, I had a most unusual start to an evening barbel session on the Derbyshire Derwent. I just had to write the story down for posterity! As I was walking to bait up a few spots I heard a faint bleat of a sheep, close by, but the only ones I could see where at the other end of the field. Another bleat; that came from the river! 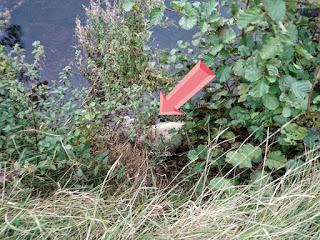 I looked below the sheer, high bank I was stood on and there was a sheep, completely stranded, above its armpits in water! 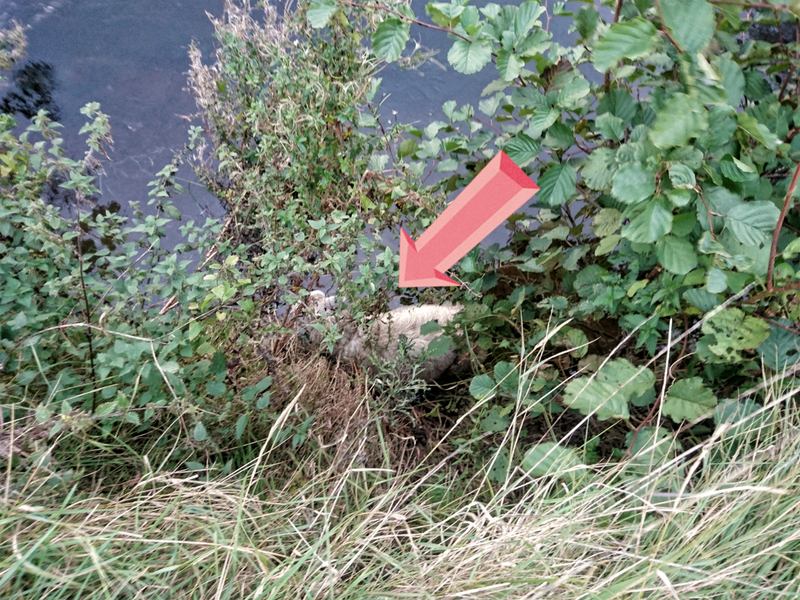 With a high bank one side and deep water the other, this sheep was well & truly stuck there. 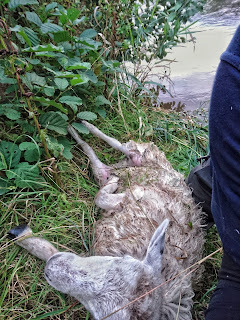 There was a small ledge behind the sheep and, as I had my waders on, I thought if I could get the sheep onto that I could possibly lift it up back into the field. I didn't really think I stood a chance of moving it but I had my thigh waders on so I found a way into the water, which was only just shallow enough to not overflow into them. 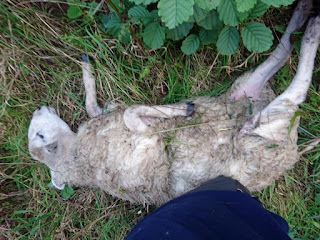 The sheep seemed completely exhausted and thankfully didn't struggle, but it also didn’t help itself either. Getting it onto the ledge was awkward because its legs just went floppy! I could only grab handfuls of wool and this waterlogged sheep was surprisingly heavy, so there were a few precarious moments! With a bit of heaving I managed to move the sheep to a spot where we could both get our breath back. I knew I couldn’t lift the sheep any further up the high bank by its wool, so I thought hard what to do next. 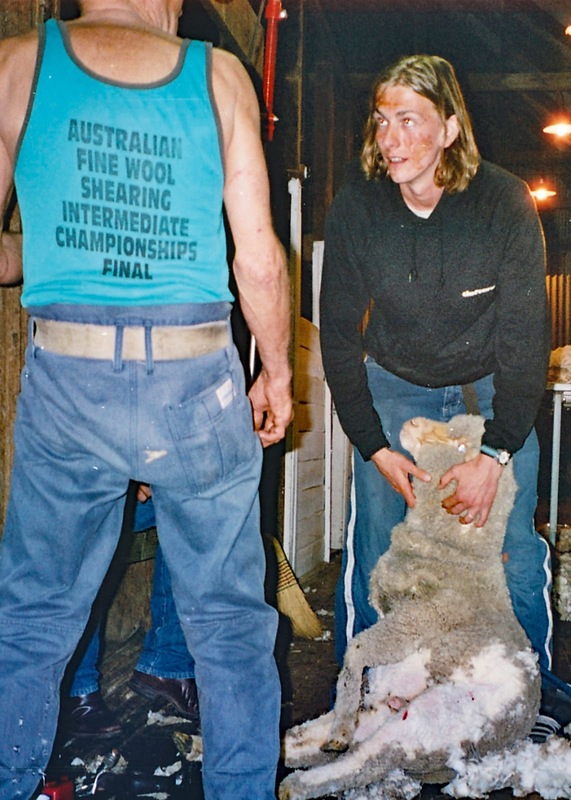 I spent a few weeks on a sheep station in Australia, about 15 years ago, and I thought back to how the sheep shearers dragged large sheep around by the legs, quite easily. 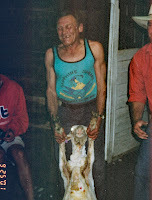 So I rolled the sheep over, grabbed 2 legs in each hand and hoiked it up the bank. I managed to get it (and myself) up to safety and within a few minutes it was off happily chewing grass! 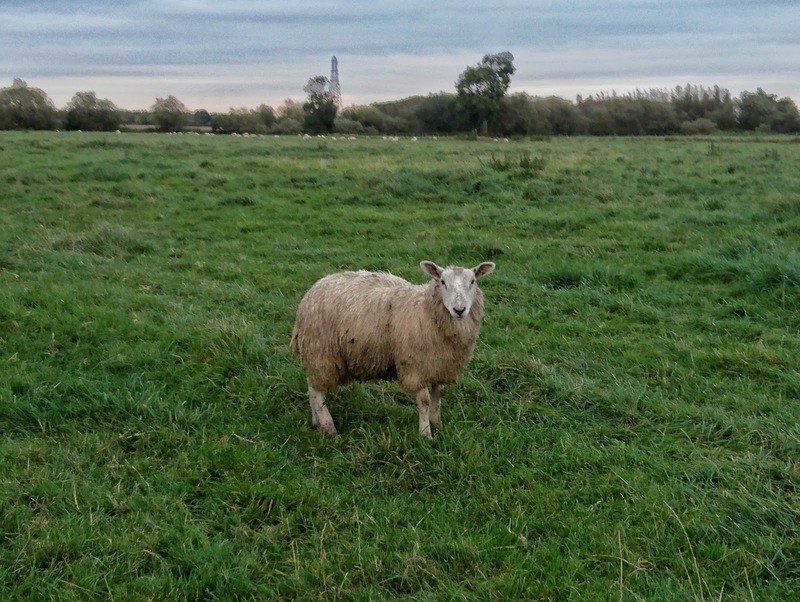 I was still worried for the chances of the sheep, so I searched for local farms on Google Maps and called the nearest one with a phone number. 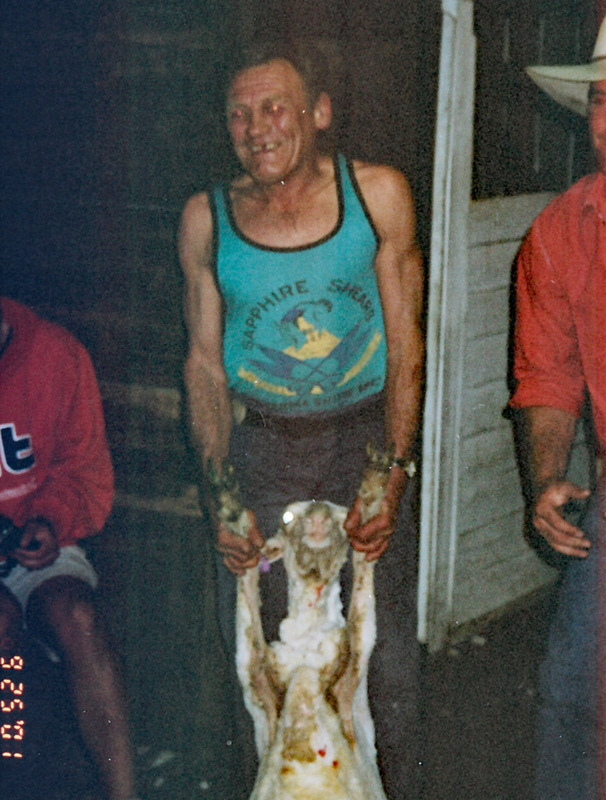 It wasn’t the right farm, but he knew the farmer they belonged to. He advised me that as long as the sheep was walking okay, "they’re pretty resilient things” and it should be fine, but he thanked me for my concern & efforts and promised to let the farmer know. The night dropped quite cool later on and with the water so high up the sheep’s body, I’m sure it wouldn’t have seen the night through if I’d left it where it was. The two most likely outcomes would surely have been drowning or hypothermia. I was hoping for a bit of good karma after my good deed, but I didn’t get as much as a tip tremor all evening!